At the top level of pickleball, players can dink forever and mostly can hit any shot they want at anytime. Of course, they’re human so they still make errors but they are few and far between. In order to win they have to add something to their game that is above and beyond simply dinking back and forth or hitting solid 3rd shot drops. The best players add an element of surprise to their game. A great surprise shot is the Erne. In this video, we’ll show you how to setup and execute the Erne in pickleball. What is the Erne in Pickleball? The Erne is a surprise shot that typically will be initiated out of dinking rally when all four players are at the net but not necessarily. We have seen it done before when setup with a drop from the baseline even right from the return. It’s an advance shot even when executed beginning from the NVZ line and requires precise timing, quick movement and particular setup in order to work. We don’t not recommend setting it up off a drop from the baseline. Although it is possible, it is very difficult and requires a VERY high level of skill to pull off successfully. An Erne is when a player steps outside the inner part of the court and on the other side of either the right or left sideline and comes forward to be parallel with the kitchen but is in fact standing outside the kitchen on the other side of the sideline. The ball will be struck out of the air and very close to the net. It is the only way to legally get that close to the net in order to play the ball. What makes an Erne legal? It is legal because you are not standing in the kitchen. Both feet must be established outside the sideline prior to contact with the ball and you must make contact with the ball on your side of the net. You cannot reach over and make contact with the ball before it crosses the net onto your side. An opponent is usually not looking for someone to sneak to the side of the of the court to execute the Erne so it often comes as a surprise, is a very offensive move and often scores a point if setup and executed correctly. Typically, you are in the best position to set yourself up for the Erne and execute it on the player that is directly in front of you. 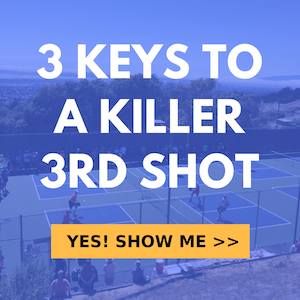 You will want to hit a dink ahead of you that hugs the line and gets them a bit stretched which will make it difficult for them to hit the ball cross court which is exactly what you want. You need them to hit back down the line too you so that you can reach the ball from your position standing outside the kitchen. If you anticipate that they are going to hit it down the line then it’s time to make your move. You must leave before they make contact with the ball so that you have time to establish your feet outside the kitchen line if you traveled through the kitchen. If you jumped the kitchen or moved around the kitchen then you only need to have one foot down when you make contact. You’re momentum upon executing the shot cannot have you falling back into the kitchen as that will be a fault and you will lose the point. To see all this in action and to learn a good way to practice the Erne, watch the video at the top of this post. I just wanted to comment and say you make some of the best pickleball videos I have found. Great stuff!